In addition, please watch our webinar. We discussed smartphone price trends from over 29 countries. We also looked at the impact that the secondary market of smartphones have on lowering Average Sales Price (ASP) and age of smartphones in use. Bangladesh had the oldest Android smartphones in 2017 at an average of 955 days, up by 240 days (an increase of 33% over 2015’s age). Thailand had the least change since 2015, with only a 75 day increase in 2017. India had the most change since 2015, increasing the age of smartphone by 273 days in 2017. 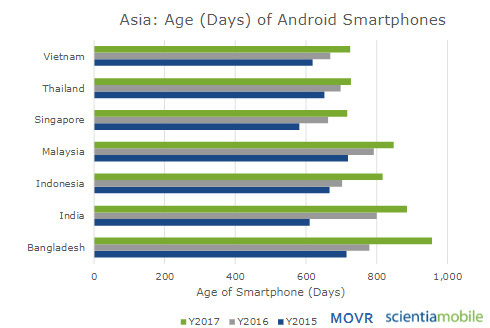 The average change in Asia for Android smartphones was a 158 day increase from 2015 to 2017. The average age for Android smartphones was 652 in 2015 and in 2017 it was 810. Bangladesh had the largest increase in age of smartphone for iPhones from 2015 to 2017, a 90% increase in days from 756 to 1,439. Malaysia had the second largest increase in iOS smartphone age, a 70% increase from 675 to 1,151 in three years. 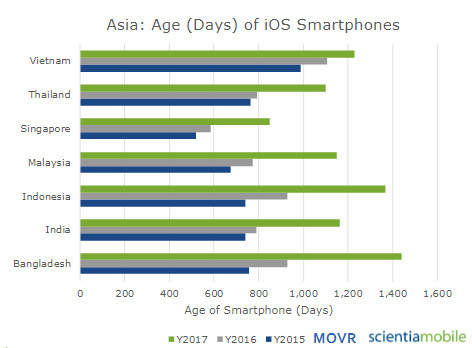 Singapore has the newest iOS smartphones in Asia, with the age in days of only 519 in 2015 and only 851 in 2017. Vietnam saw the least change in iOS smartphone age in Asia, with only a 25% change from 2015 to 2017.